In Banjar, Himachal Pradesh, stands a stunning cottage with wooden exteriors and stone walls that you can call home–at least, for a while. This cottage can comfortably accommodate six people, so this is perfect for a family getaway. 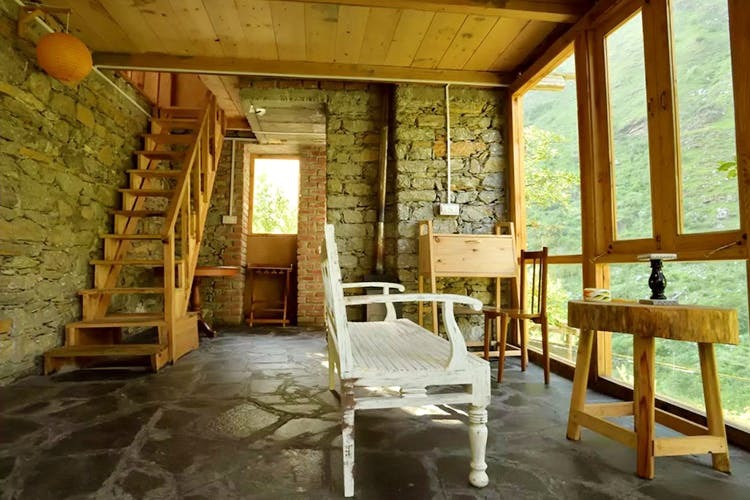 This cottage, christened 'For A While', is the home of Debapriya (an ex ad-man) who fell in love with Phalachan Valley way back in 2001 and decided to move there with his wife Shalini—albeit many years later. By opening For A While up to travellers, he hopes that they will understand exactly why he moved. Wooden staircases, exposed brick and stone walls, a writing corner that comes with a desk and great views, big windows and beautiful rooms—For A While is the mountain home of your dreams. Shalini is happy to open her pottery studio to guests and even lend a helping hand, if you’d like to take a stab at the wheel. In addition to taking leisurely strolls by the river, curling up with a good book and sampling the delicious food at For A While, there are lots of activities to keep guests busy. You could gear up for a spot of mountain biking, take your father for an afternoon of trout fishing or settle down for some bird-watching (there are over 200 species to spot!). You can only get BSNL internet service at this homestay. So, if you're someone who can't live without internet, you will be disappointed. On the other hand, this house is the perfect place for a digital detox. In case you plan on drinking, carry your own liquor as the hosts do not serve the same. Price: Starting at INR 8,000/night.